First, we went to the bakery, where sour cream donuts, a blueberry danish and a banana were purchased. Coffee in hand, we walked down the block to the bookstore. We sat on the bench on the sidewalk and munched on our pastries while we waited for the bookstore to open. The owner of the store saw us sitting out there and opened up early for us. Ah, how I love small towns. We picked up the book “Weird Wisconsin” and paged through it, looking for an interesting destination. Beth offered to buy the book and the girls exchanged wide-eyed smiles as they suddenly realized that this will be a Roadtrip like no other. This time they have people along with money in their purses and a penchant for indulging their children. We strolled to the town square and sat on the grass while taking a vote on which direction to head. Northeast was agreed upon for various reasons, but mostly we just decided to take off to see what we could discover. Our first stop was at the “La Rue World of Miniatures” in Pardeeville. (Who wouldn’t want to live in PARDEEVILLE?) We drove right by it at first, but Anna spotted the attraction amidst the overgrowth. 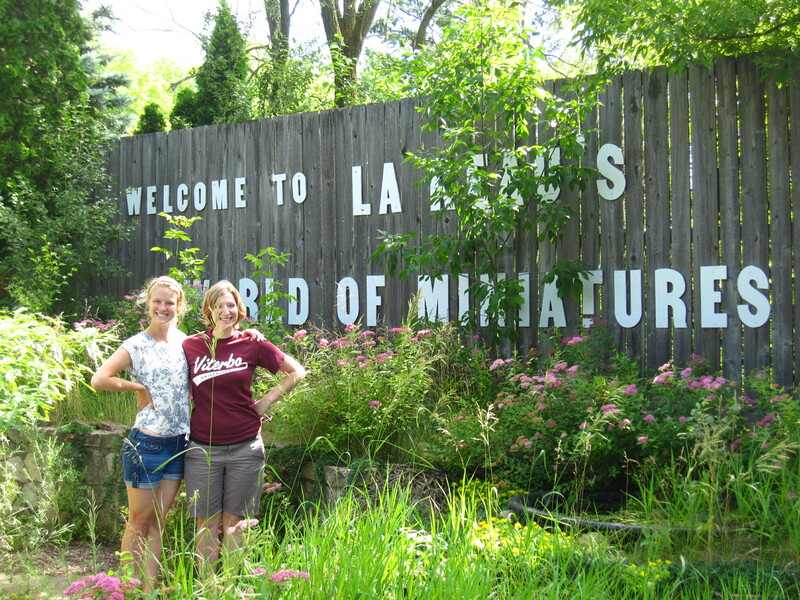 Evidently, LaRue’s is no longer in operation and hasn’t been for quite some time; but no one was around and trespassing on an abandoned world of mini-statues seemed an appropriate way to start the Weird Wisconsin Roadtrip. From there we continued down the road to Princeton where a huge flea market is held every weekend in the summer. I bought three old yardsticks for just $.21 per inch. As we were leaving, a man called out to me, “Do you collect those?” He told me he had a bunch of them in his workshop he’d sell me cheap. Then he proceeded to tell me how to get to his place a few miles out of town and what barn his shop was in and to go in the door on the east side of the barn and just to the right of his bench is a pile of those yardsticks I could have cheap. We turned down that adventure. Trespassing once was enough for one day. Continuing northeast, we found ourselves in Oshkosh, b’gosh. Since it was well past noon, and we were dangerously close to that hot-grumpy-hungry state, we stopped at the New Moon Cafe for refreshment. They were kind enough to prepare something off-menu for some of our special dietary needs and we all felt rejuvenated for our next stop: the Oshkosh Public Museum. Evidently, this was the home of a very special clock called the Apostle’s Clock. 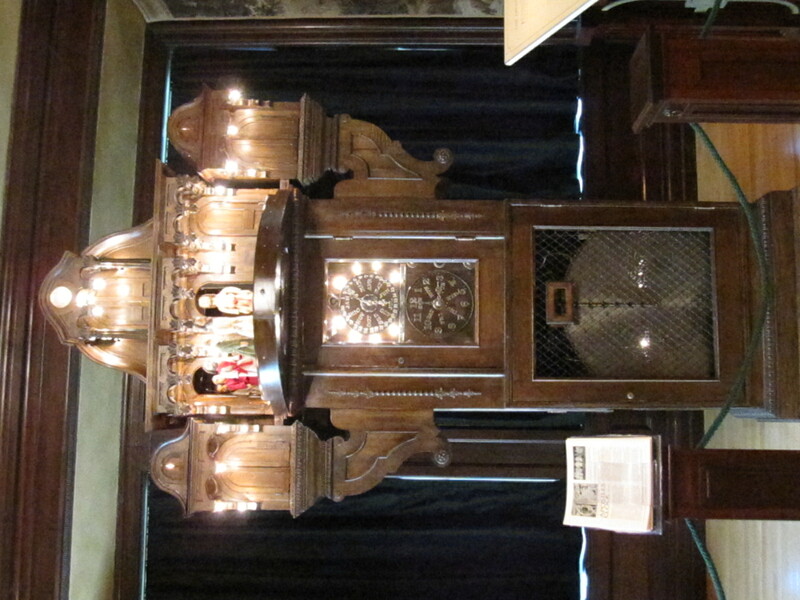 Every hour on the hour, this 114 year old clock would spring into action. Jesus would come out the top door and the twelve apostles would pass by Him and bow their mechanical heads. All except Judas, that is. When he would come out the little door and go by Jesus, Judas would turn his back to the Lord. That 30 seconds of drama is what we came 90 miles to see. However, squeals of delight came from the backseat when the girls saw an unexpected sign out in front of the museum: PotterFest. I couldn’t believe it when I realized Harry Potter was just about to trump Jesus and the Apostle’s Clock. 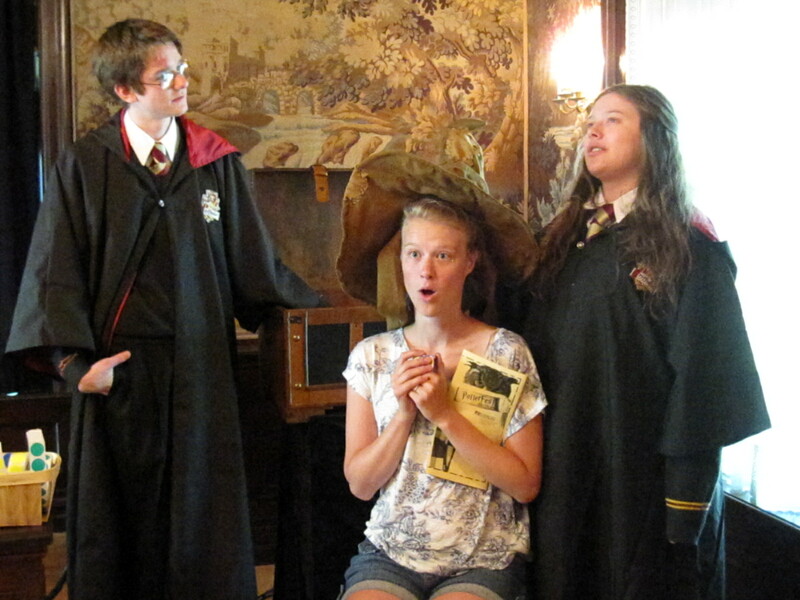 I also couldn’t believe it when I paid for two $7 admissions to Wisconsin’s rendition of Hogwart’s. Harry and his friends were there and even though I’ve never read any of the books, their presentation was quite entertaining. After being “sorted” and having our tea leaves “read”, I did feel a twinge of guilt when the clock struck the hour and Jesus walked out of the little door. On the way home, we drove through the beautiful Green Lake Conference Center resort area. Unfortunately, the prayer tower was locked so we couldn’t climb up to take in the panaramic view of the lake. To their credit, the girls tried like the dickens to pick the lock with three bobbie pins, but to no avail. 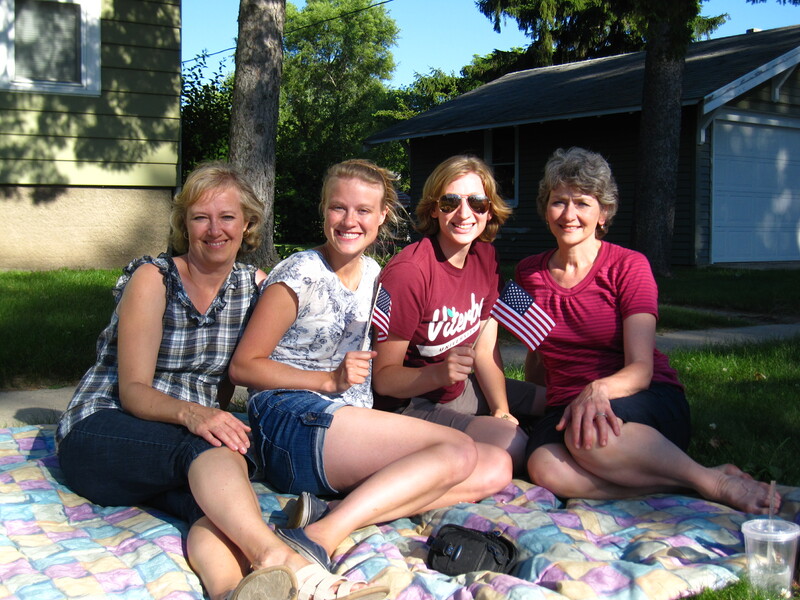 Further down the road, a little town was kicking off its 4th of July parade, so we plopped down on a blanket and soaked up some small town patriotism. We clapped for the middle school band with one lone trumpet player trying his best to carry 12 squeaky clarinets in “America the Beautiful”. We picked up candy and gave it to the little boy next to us, except for the Tootsie Roll that Beth made a dive for. We cheered for the Shriners on their little scooters and bought the girls a brat. 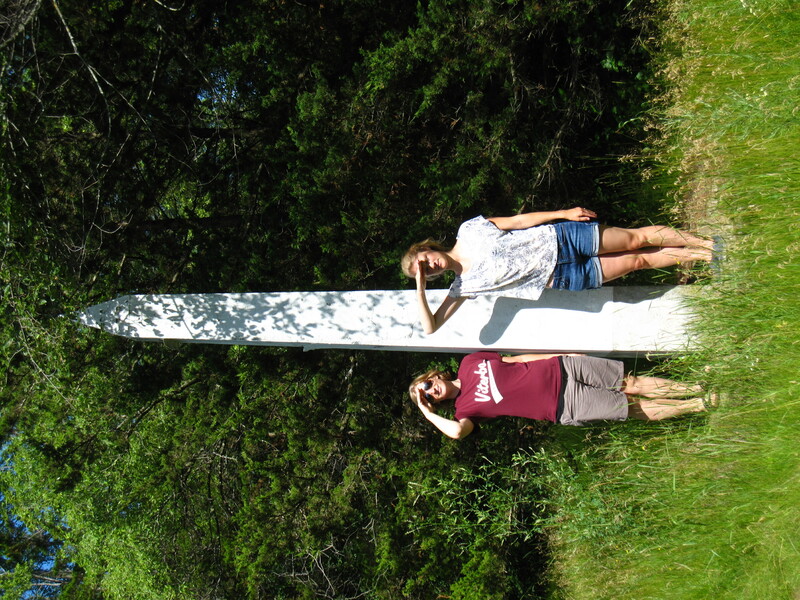 There were still three sites on our list to see in Montello: the waterfall, the tombstone of the boy who would not lie, and the state’s biggest tree. We saw the waterfall, passed on the cemetery, and pulled up beside the tree, but only Beth wanted to get out and see if the four of us could reach all the way around it. I admired her energy; she could have kept going for another 90 miles, I think. Instead, the three of us looked at her with tired, sad eyes and she took pity on us. We headed home and enjoyed nice conversation down the highway. 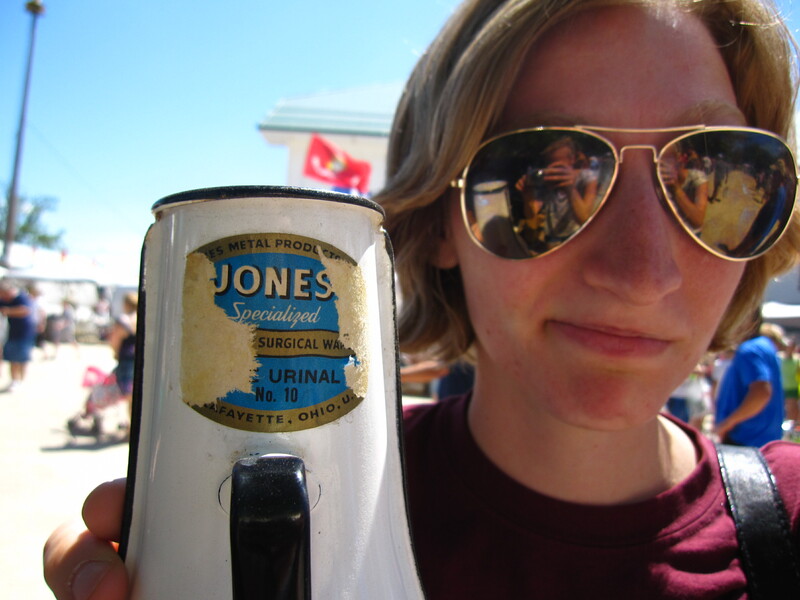 This was declared “the best Weird Wisconsin Roadtrip ever”. 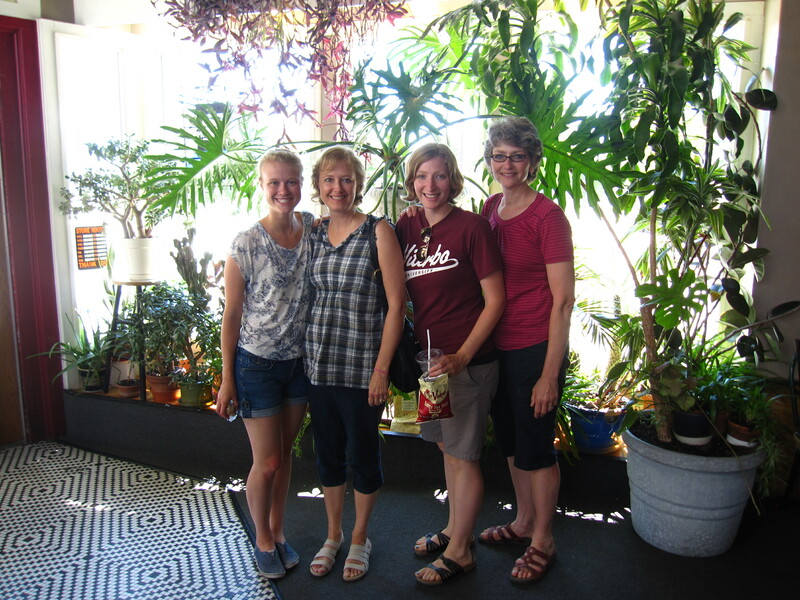 Thanks, girls, for inviting Beth and me to join you on your summer day adventure. As if being your moms wasn’t adventure enough! Anna and Sydney found the long lost World of Miniatures. 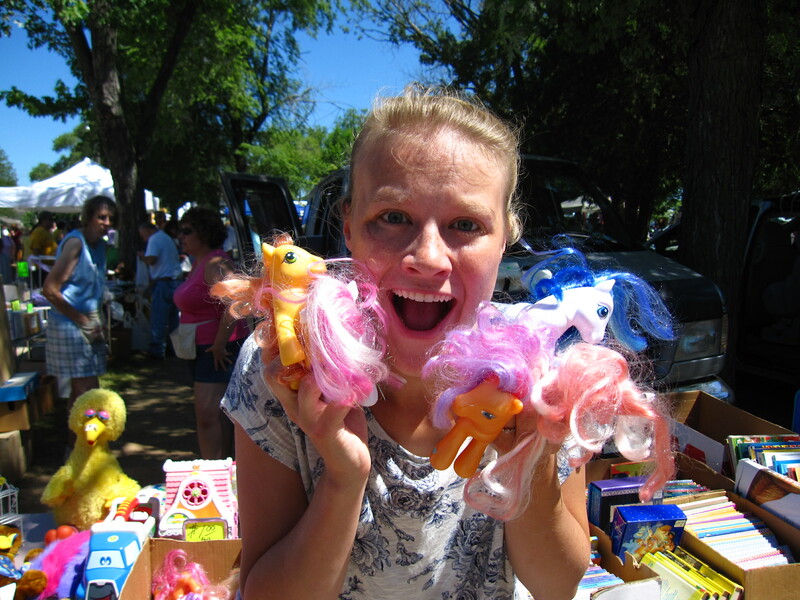 Anna finds MyLittle Ponies at the flea market. Sydney wonders what the white container is. New Moon Cafe – a cool place to eat lunch. Anna being sorted by Harry and the talking hat. 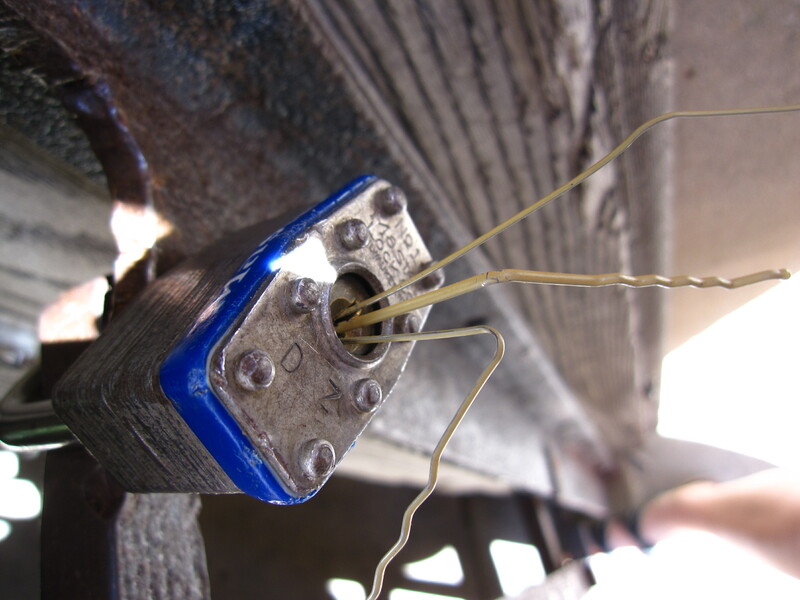 The lock that would not be picked. Last stop: 4th of July parade. Very fun, Dinah! Couldn’t have recounted it better myself. Thanks for including the photos too. Maybe we’ll get invited again?! Hope so! Here’s to life, love and laughter with our girls! Looked like a wonderful mother/daughter day! How lucky we are to have our girls!